What are bushfire prone areas? Quite simply, bushfire prone areas are sections of land that are susceptible to bushfires. These are the areas that your local Council, such as Hornsby or Ku-ring-gai, and the Rural Fire Service, have identified. The classifications consider the type of vegetation and fuel load. They also identify any buffer zones relevant to properties that are in the zone between the bush and the remainder of the residential area. Is my land on Bushfire Prone Land? You can visit your local council customer services counter where they may have a copy of land maps that identify bushfire prone areas. You can also check online here. Each Council have their own coded maps. These maps identify the Vegetation Zones and the Buffer Zones. The Buffer Zones are usually 100 meters wide or 30 meters wide depending on the classification of the vegetation. Important: If either the vegetation or the buffer zone intersects any point of your property, your property will be considered “Bushfire Prone Land”. Your property has its own BAL rating, and while your neighbour’s BAL rating may be similar to yours, your property would still need an individual assessment. What do I do first to prepare to renovate on Bushfire Prone Land? Start by calling a designer who is experienced in this field. They will be able to explain all of the items in this article. The most common thing that people overlook is selecting a designer who is experienced in designing for Bushfire Prone Land. Often people call a builder, engineer, neighbour or an otherwise very good designer. However they do not all have the expertise to navigate the approvals and the latest requirements for building on Bushfire Prone Land. Can I build or renovate on bushfire prone land? Yes, you can. However, there are certain guidelines and requirements. Your local Council and the Rural Fire Service determine these and you must follow them. This ensures that you are following protective measures set to make your building less susceptible to damage or destruction. The purpose of these guidelines is to make sure that your home receives adequate protection from bushfires. If you are planning a renovation, the changes to your home will need to meet these set standards. This will include the use of specific construction materials. What should I keep in mind when preparing to build or renovate on bushfire prone land? Start by engaging a Designer with experience in designing for Bushfire Prone Land. This professional will know the relevant information you need. If you think that your home is on bushfire prone land, be sure to confirm it before you start on the design of your home. Every property is unique. So the best way to establish the Bushfire Attack Level (BAL) rating is to engage a qualified Bushfire Consultant. He or she will create a report for your property. Your bushfire experienced Designer can usually guide you with a Bushfire Consultant or organise this report for you. This will, in the long run, save a lot of time and money because you will be preventing expensive changes to your plans. If you’re planning to renovate on bushfire-prone land in Sydney’s northern suburbs, feel free to get in touch with me. My extensive experience with designing, the regulations of our local councils and up-to-date knowledge of building materials that meet local bushfire standards, should be highly valuable. My team and I have worked on many projects with low or high BAL ratings, specifically in the Sydney councils. 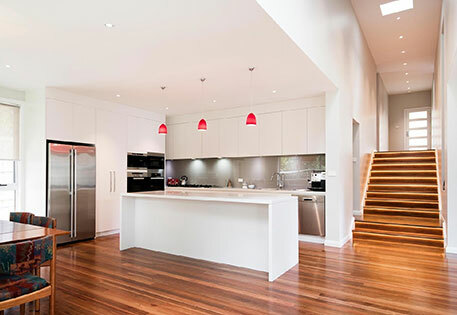 If you want to find out about the feasibility of your home renovation on bushfire-prone land, give us a call today.